Golf club shafts are available in five main flexes. Golf club shafts are available in five flexes and may be made of steel or graphite. Clubhead speed determines the flex a golfer needs. The higher the speed, the stiffer the shaft. 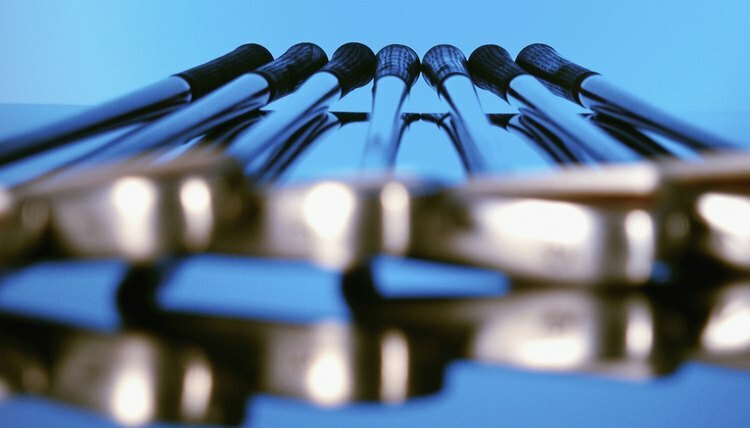 Steel shafts, which are heavier than graphite, are stiff and less forgiving than graphite. According to Golf.com, graphite shafts are lighter and can help increase swing speed. Selecting the right flex for your shaft is key to good ball striking. Designated as "X" on the flex scale, extra stiff shafts are recommended for golfers who routinely drive the ball 260 yards or more and have a swing speed of 93 mph or higher, according to LearnAboutGolf.com's flex chart. Extra stiff shafts are usually made of steel and are recommended for professional golfers, or golfers with unusually high clubhead speed. Designated as "S" on the flex chart, stiff shafts are recommended for golfers who regularly drive the ball 240 to 260 yards and have a swing speed 84 to 93 mph. Stiff shafts are appropriate for men with single-digit handicaps as well as some with handicaps 10 to 15 who have high clubhead speed. Stiff flex is available in graphite or steel. The most common flex, regular, is designated as "R" on the flex chart and is recommended for golfers who regularly drive the ball 210 to 240 yards and have a swing speed between 75 and 84 mph. Steel and graphite shafts are available in regular flex, which is appropriate for men with mid to high handicaps. Designated as "A" on the flex chart, shafts with senior flex are recommended for golfers who regularly drive the ball between 180 and 210 yards, and have a swing speed of between 60 and 75 mph. Older male golfers and some women with unusually high swing speeds should use this flex, which is also referred to as "A-Flex." Clubs with senior flex are usually made of graphite. Recommended for the slowest swinging golfers, the ladies flex is designated as "L" on the flex chart. Golfers who routinely drive the ball less than 180 yards and have a swing speed of 60 mph or less should use the ladies flex. This flex is an appropriate choice for slow-swinging older male golfers and women, who generate less clubhead speed than men. Ladies flex is most commonly available on graphite shafts.